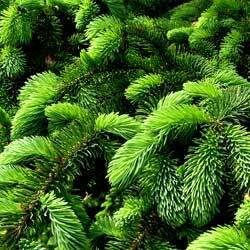 From the Fir Family come some of our most beloved Christmas trees, the Colorado, Norway and White Spruce varieties. Both the Colorado and Colorado Blue Spruce have a nice pyramidal shapes with strong limbs that can hold heavy ornaments or light strands. The Colorado Blue is set apart by its stunning steel-blue foliage. 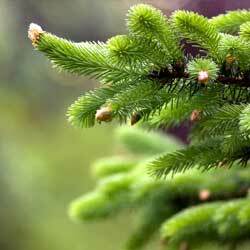 The Norway Spruce has short, soft, deep green needles and the White Spruce possesses a robust full form. 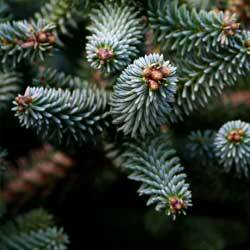 Both the Norway and White Spruce should be purchased planted in containers or balled and burlapped as they tend to lose their needles quickly when cut. Beyond the holidays, spruces make a lovely addition to any landscape. When viewed in the northern forests, these majestic, needled evergreens are glorious with their graceful, symmetrical, conical forms. Smaller landscapes may also enjoy the merits of this genus with the many slow-growing and dwarf cultivars that are commonly offered, many of which are also ideal when selected as living holiday trees. Larger spruces work wonderfully planted in a row as a windbreak but shine equally as well when chosen as a specimen plant. Added benefits include deer resistance and salt tolerance. If you do opt for a bagged, balled or potted spruce, there are certain steps you need to take so they can survive the rigors of the holiday and be ready for planting. Only leave a live spruce tree inside the house for a maximum of 5-7 days. If possible, place the tree in a garage, carport or sheltered area to help acclimate it to a warmer location before putting it into the house. Keep the root ball moist. Before bringing indoors, spray the tree with Wilt-Pruf to help keep it from drying out. Place the tree in a tub of 2 inches of water and cover with newspaper or mulch to retain moisture. Place the tree away from heating vents, wood stoves and baseboard heaters. Check water level daily and refill as needed. Prepare your planting hole outside by digging it early and covering with plywood until needed. Store soil in the garage so it does not freeze. If possible, acclimate the tree once more by putting it in a garage or sheltered area for a few days before planting outside. Continue to keep the root ball moist. Plant the tree as you normally would, mulch and water well. Plants require full sun, good air circulation and moist, well-drained, acidic soil. Spruces are shallow-rooted and should always be planted high rather than low. Mulch the root zone with a thick layer to keep plant roots cool and moist. Consider available space and ultimate size of the chosen variety before planting. Since we are interfering with the natural growth cycle of these trees, their survival through the season cannot be guaranteed. However, customers who have purchased living trees from us and followed the guidelines have reported 80-85 percent success rate with the trees thriving in the spring. It is fun to look out into your yard at trees from Christmases past!